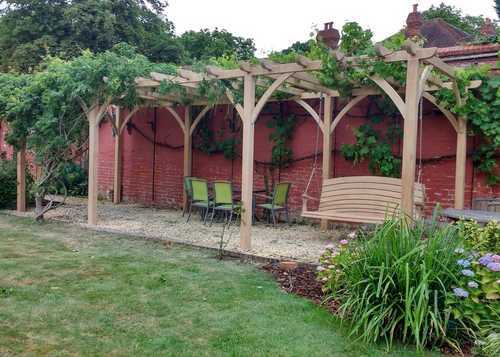 Each Sitting Spiritually Pergola is handcrafted from scratch by our expert joiners in workshops using only FSC certified Oak or Larch. They are designed to look sturdy and robust, and use extra large timbers which add strength and durability. "The best kind of friend is the kind you can sit on a swing seat with"
The best kind of friend is the kind you can sit on a swing seat with, never say a word then walk away feeling like it was the best conversation that you ever had. Each Pergola is delivered as a kit and pre-built in our workshop ensuring the bespoke timbers slot neatly and simply in to the joints when delivered to site. 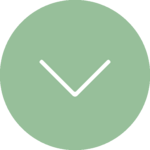 They can be secured in to the ground with concrete or fixed to a suitable solid surface. 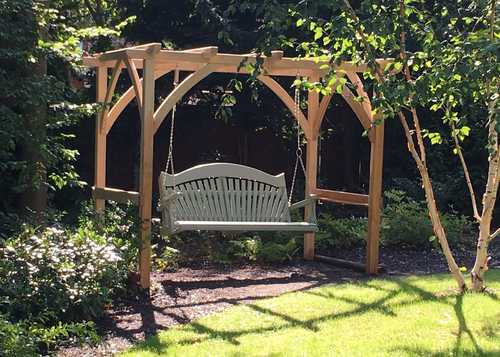 Our Pergolas can be used to hang 2, 3 or 4 seater swing seats.